The story wants that there is a love story behind the creation of Cuisines Steam. What the story does not say, however, is that it's a love story between the founding couple and food we're talking about! Also, cooking is not only the livelihood of the Cuisines Steam employees, it is also a passion shared by all. At lunchtime, it's not uncommon to hear Marie-France share her rosé sauce recipe with Marie-Claude or Brigitte talk about her experience at a restaurant this past weekend with Manuelle. It is easy to say that Cuisines Steam’s employees are foodies! As foodies, we are blessed to be in Montreal. Indeed, Montreal is full of delicious restaurants. 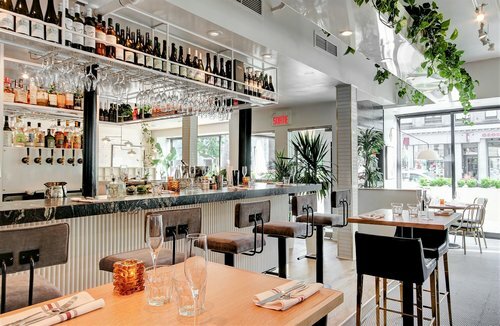 Every year, the OpenTable online booking site lists the top 100 Canadian restaurants, and Montreal ranks second as one of the country's hippest cities with 21 addresses in the list. We are aware that we are not OpenTable, but we decided to hold a monthly ticket where we will present our favorite restaurants in Montreal (our co-founder was on the jury for Canada's 100 best nonetheless!). Small, charming and lively restaurant of Little Italy where regulars meet to enjoy a series of dishes all as good as each other. To share or not, the dishes are festive, imaginative with what I know what makes you want to start again ... but especially to return. Cuisine: how to say ... market cuisine, home cooking, Montreal cuisine! If you have not been to Bouillon Bilk yet, you must remedy the situation immediately! With its eclectic modern French-inspired cuisine menu, we believe it is one of Montreal's best addresses, especially for its excellent value for money. Located near the entertainment district, this is the perfect place to spend a divine evening in the vibrant heart of Montreal. The dish to remember: everything on the menu! If you are in no hurry and want to eat Japanese, go for a walk on Ste-Catherine street and stop at Kazu, you will not be disappointed! Although there is always a queue, it is definitely worth the wait. We are talking about an authentic Japanese menu with fresh products and excellent quality, both for lunch and supper time. Once the wait is over, you get offered a place at the small counter where you can watch the team of cooks activate before your eyes. As real foodies, we also love trying out new addresses. This month, we want to try the brand newJosephine restaurant. Located at the corner of St-Denis and Duluth, it offers a menu of tasty seafood and fish dishes that all seem more tasty than the other. With a decor drawn from your favorite pinterest board, it seems it has everything we need for a perfect evening! We'll keep you posted! And you, what is your favorite restaurant in Montreal? Share your favorites with us in the comment section and maybe you will be quoted in one of our next article, who knows!